The territory of modern-day Uzbekistan and its close neighbours have seen many empires rise and fall. The Sogdians, the Macedonians, the Huns, the Mongolians, the Seljuks, the Timurids and the Khanates of Samarkand, Bukhara Khiva and Khorezm all held sway at one time or another. Central Asia really came of age with the development of the Silk Road from China to the West, the most valuable trading route of its day. 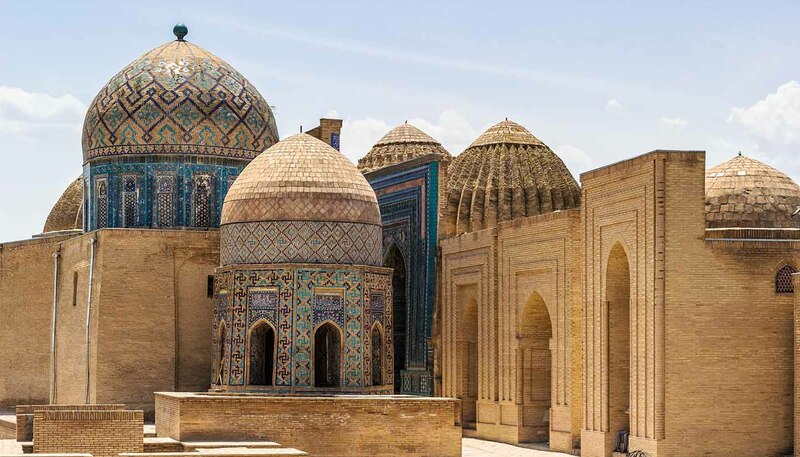 The riches that it brought were used to build fabulous mosques and madrassars (Islamic colleges), most of which were destroyed by the Mongol hordes in the 13th century. Much of the damage was repaired and under Timur the Lame, many new cities were built in the 14th century. Timur conquered all before him and, at its height, his empire stretched to Moscow and Baghdad and as far west as Ankara in Turkey. After his death, the empire crumbled and Central Asia was split into warring Khanates. The Russians had long had their eyes on the lands over their southern border, ever since Peter the Great sent his first military mission to Khiva in 1717, but it was to be another 150 years before they started to make any real headway. In 1865, Russian General Konstantin Kaufmann took Tashkent and signed agreements with the Khans. However, following the Russian Revolution, the Bolsheviks were resisted in Central Asia by bands known as Basmachi until the 1930s when they were finally suppressed and Moscow took control. The history of Central Asia under Soviet rule is one of exploitation. Uzbekistan was turned into a cotton monoculture and most of the product was processed north of the Urals, in Russia and Ukraine. Intensive cotton cultivation in Uzbekistan has in fact been linked to the drying out of the Aral Sea, one of the biggest ecological disasters in Central Asia. Politically the country hasn’t fared much better. Islam Karimov has governed Uzbekistan with an iron fist since 1989 when he took over as head of the Uzbek Communist Party (now the People’s Democratic Party of Uzbekistan), retaining his position as the new country declared independence from the Soviet Union in 1991. His government has taken an uncompromising line against all opposition, resulting in a dreadful human rights record with reports of violations such as torture, arbitrary arrest and the forced sterilisation of women. •	Muslims constitute some 90% of Uzbekistan’s population. Most are non-denominational and independence does not seem to have precipitated an upsurge in fundamentalism. •	Uzbekistan has the largest armed forces in Central Asia, with some 65,000 servicemen. •	Around a third of the country’s population is aged under 14. Predominantly Sunni Muslim, with Shia (15%), Russian Orthodox and a remaining but tiny, Jewish minority (in Bukhara). Uzbekistan is a Muslim country, albeit a fairly liberal one where women often wear jeans and skirts in the cities. However, for visitors it’s best to cover up out of respect to the local culture and to avoid unwanted attention in all areas, but especially in the conservative Ferghana Valley. Minorities include Tajiks, Kazakhs, Tatars, and Karakalpaks who all contribute to the host culture with their own Central Asian customs. In general, lipioshka (bread) should never be laid upside down and should never be put on the ground, even if it is in a bag. It is normal to remove shoes but not socks when entering someone's house or sitting down in a chai-khana. Hospitality is genuine in Uzbekistan and many follow the saying: "The visitor is dearer than your father." While crime is rare, it’s wise to avoid ostentatious displays of wealth (eg jewellery) in public places. Homosexuality is illegal. Photography: Photography near airports, military barracks and police stations can upset the authorities. Most people in Central Asia react well to requests for photographs, but be respectful, always ask and be aware that some older people might not be so forthcoming.